The theme of the Australian Rangelands Conference 2019 is “Resilient future rangelands: integrating environment and livelihoods”. Covering more than 70% of the country, the rangelands are culturally important to all Australians, a key component of Australia’s identity and makes a significant contribution to Australia’s economy. The Conference will bring together industry representatives and practitioners, researchers, and policy makers. It’s a great opportunity for sponsorship to promote your organisation and develop strategic networks. The conference will consider issues such as management of rangelands, improving land use productivity, diversifying livelihoods, sustainable land use, social licence to operate the importance of indigenous local knowledge, and of women, to enabling resilient rangelands and coping with change. The Conference will maintain its usual interest for land-holders and other practitioners, but with more focus than usual on policy. It will engage domestic policy interest in areas such as northern development, Indigenous affairs, environmental stewardship and climate policy, whilst seeking to reinvigorate Australia’s connection to the UN Convention for Combating Desertification (UNCCD) and other international activities, partly by showcasing Australian expertise that is or could be applied overseas. The Conference will attract rangelands people from across the continent to meet with a significant number of attendees from national policy and NGO backgrounds, as well as a small but important number of overseas attendees. Canberra is the birth city of the Australian Rangeland Society, but the ARS has not met there since its foundation. The ARS proposes that is timely to meet in Canberra again as a springboard for raising political and policy awareness of the rangelands once again, in synergy with other engagement efforts. 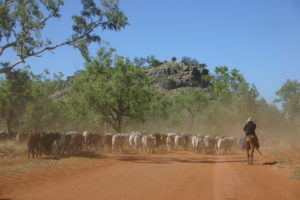 This awareness would have both domestic and international drivers – engaging the policy world with rangelands practitioners and researchers in order to highlight the need for more attention to be paid to our own rangelands, but also to show how Australian rangelands expertise is and could be influential internationally. As a location, Canberra is easy to access with proximity to temperate rangelands for field trips; there are also many attractions in the city, including museums, galleries, zoo and arboretum, and growing social and cultural venues. Canberra is ranked #3 best city to visit in Lonely Planet’s best in travel 2018. The meeting place, the Kambri Centre at the Australian National University is a great new facility with easy access and ample accommodation nearby. For more information, download the Australian Rangeland Conference Flyer (PDF, 750 KB) here.